Home / Modern Pest Blog / Is a Carpenter Ant Invasion on the Way? Is a Carpenter Ant Invasion on the Way? Experts predict that 2019 could be a busy season for carpenter ants. “A winter with a large snowpack usually leads to an uptick in carpenter ant activity in the spring,” said Joe Hyland, one of Modern Pest’s Associate Certified Entomologists (A.C.E.). Snowfall totals throughout Maine were above average, with Northern Maine well above average. It provides an insulating “blanket” to protect them from the worst of the freezing temperatures while they are in a form of hibernation called diapause. As the snow melts, it provides the ants with moisture and hydration which is important for carpenter ant development and activity. “Add some heat with warm spring days, and we’re off to a busy ant season,” said Joe Hyland. New to Modern Pest? Scheduling your service just got easier! They get their name because they excavate, tunnel, and live in wood. Both red and black carpenter ants live in New England, but black are most common. They are among the largest ants in the region, growing up to 3/4-inch in length. Contrary to popular belief, carpenter ants do not eat wood. They tunnel through it to build new nests. While most carpenter ant nests are located in dead trees, they will gladly use your home for a new nest site. Any wet or rotten wood will attract a new queen. When they do enter a structure, it’s because dampness or rot has made the wood easy to excavate. They can gain access to your home via tree branches that touch your home, clotheslines, woodpiles, or utility wires. If there is an abundant food and water supply near the nest, the colony will grow quickly. The workers must increase the size of the gallery to accommodate this growth. It is this excavating that damages and weakens wooden structures in your home. You might not even notice the damage since the tunneling takes place without any externally visible signs. 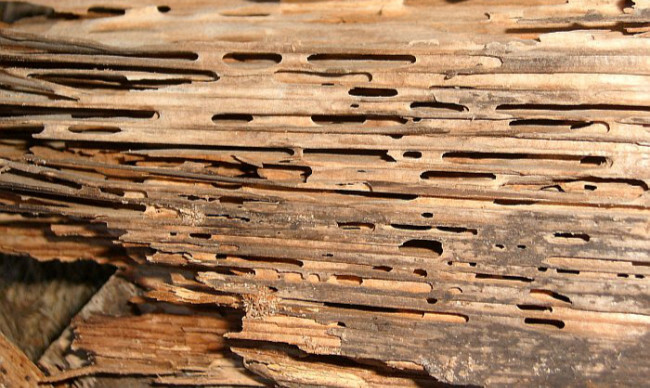 If you have frequent carpenter ant damage, you might have a leak that is creating the wet, rotten wood that ants love. Store firewood off the ground and away from the house. Use ant-proof containers for food storage. Block access. Seal cracks in the foundation and block entrances around pipes, vents, wires, etc. Repair leaks in the foundation, walls, chimney, roof, and door and window frames. Keep rain gutters clear of debris. Reduce moisture. Improve drainage and increase ventilation to damp areas around the house. Mulch (gravel/stone) around the perimeter of the building. Trim trees and shrubs to keep limbs away from the building. Replace decayed or moisture-damaged wood. If you have found a nest, it will need to be eliminated. Since there aren’t any completely nontoxic control methods, it’s best to leave it to the pros and call Modern Pest. Modern’s Homecare Green program protects against over 50 common household pests, including carpenter ants. Modern’s carpenter ant control service provides an effective treatment for carpenter ant infestations while minimizing the amount of pesticides used in and around your home for the safety of your family and pets. Modern focuses treatments on the interior and exterior areas of a home where carpenter ants are likely to be working, nesting, or foraging for food. This provides residual protection against carpenter ant re-infestation. 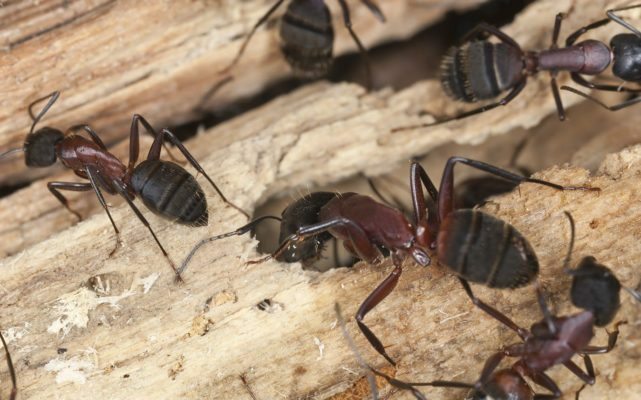 If you think you might have an issue with carpenter ants, schedule service with Modern today by calling 1-800-323-7378. New customers can click here to use our new eCommerce tool to schedule and pay for service online.